In case you haven’t heard I am on a kick now with making internationally theme pot roasts. I am taking an American classic and infusing it with flavors from around the globe. My first attempt was a Moroccan style pot roast with chickpeas and couscous. That was a huge success. So I decided it was time to try another. This time I travel east down the Mediterranean to the country of Greece. A traditional dish in Greece is Youvetsi (pronounced yoo-VEH-tsee). It is a stew featuring either beef or lamb. 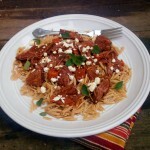 The meat is cooked in a tomato sauce along with some orzo. 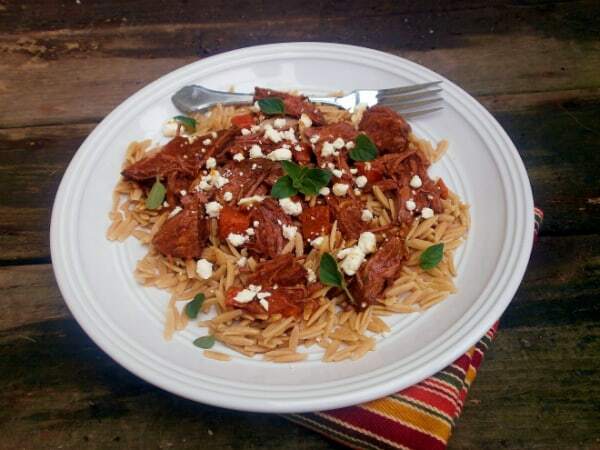 I took that dish as my inspiration for my Greek pot roast. For the tomato portion of this dish you have options. I used tomato paste the first time around. But next time I will try mixing in some leftover tomato sauce (I usually make it in large batches and freeze the leftovers). You could use diced tomatoes if you like. I just have never like chunks of tomatoes. 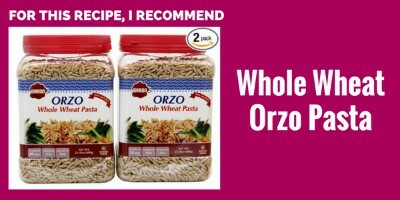 For the Orzo pasta, I used a whole wheat orzo. I know some people are put off by the whole wheat flavor, however in this dish it just compliments the beef flavor. So while I don’t use whole wheat pasta of any kind in mac & cheese, I perfectly fine with it here. The first thing you will want to do is brown the pot roast in a <a href="http://www.amazon.com/gp/product/B00008CM6A/ref=as_li_tf_tl?ie=UTF8&tag=ealinoonel-20&linkCode=as2&camp=1789&creative=9325&creativeASIN=B00008CM6A">stainless skillet</a><img src="https://www.assoc-amazon.com/e/ir?t=ealinoonel-20&l=as2&o=1&a=B00008CM6A" width="1" height="1" border="0" alt="" style="border:none !important; margin:0px !important;" />. You don't want to use non-stick because you want some brown bites to be stuck to the bottom of the pan. Heat the pan up over medium-high heat with a bit of canola oil or olive oil in the bottom. In the mean time, liberally salt both sides of the chuck roast. When the pan just starts to smoke, place the beef in. Cook until you get a nice brown sear on one side, then flip and repeat. Remove the beef to a slow cooker. Add the chopped garlic, cook just to soften, don't burn it. Then add the garlic to slow cooker. Now pour in about 1/2 cup of the beef stock and scrap all the brown bites off the bottom of the pan. I like using my tongs that have <a href="http://www.amazon.com/gp/product/B003L0OYJ4/ref=as_li_tf_tl?ie=UTF8&tag=ealinoonel-20&linkCode=as2&camp=1789&creative=9325&creativeASIN=B003L0OYJ4">tongs with silicione edges</a><img src="https://www.assoc-amazon.com/e/ir?t=ealinoonel-20&l=as2&o=1&a=B003L0OYJ4" width="1" height="1" border="0" alt="" style="border:none !important; margin:0px !important;" />. Add the liquid from the pan as well as the remaining stock to the slow cooker. Add in the tomato sauce or paste, along with the chopped oregano. It's important to taste your cooking liquid. It needs to be really flavorful. So test it first and then add any salt and/or pepper. Cook in your slow cooker for at least 4 hours. I wait to about the last hour or hour and a half to add in my carrots. I want them to be cooked, but with more texture to them than baby food. Bring a gallon of water to boil in a large pot. Salt the water so that is taste like the sea. Then add the orzo, cooking until it's no longer chewy in the middle about 7-9 minutes. Once the orzo is ready, it's time to bring the whole dish together. Put some orzo on a plate, put the meat on top. Sprinkle some feta cheese and a little bit more freshly chopped oregano. Enjoy!